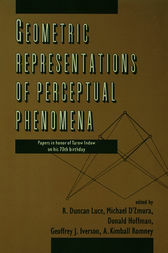 * scaling -- focusing on the organization of various bodies of data -- in this case perceptual -- through scaling techniques, primarily multidimensional ones. These topics provide a natural organization of the work in the field, as well as one that corresponds to the major aspects of Indow's contributions. This book's goal is to provide the reader with an overview of the issues in each of the areas, and to present current results from the laboratories of leading researchers in these areas.